Due to some unfortunate, ahem, rodent, issues, we were forced to do some major foundation and siding repairs on our house this year. The plan was originally to have everything done in the fall, but weather and other conflicts pushed things back to right between Thanksgiving and Christmas. It’s super fun to start a major home improvement project right between the two biggest holidays of the year…said no one…ever. Around the same time, we decided to sell our ceramic top electric stove and buy ourselves a new gas range (YAY!). I’ve been wanting a gas stove for ages, so I was more than thrilled, but that plus the renovations made cooking rather challenging at the end of the year. 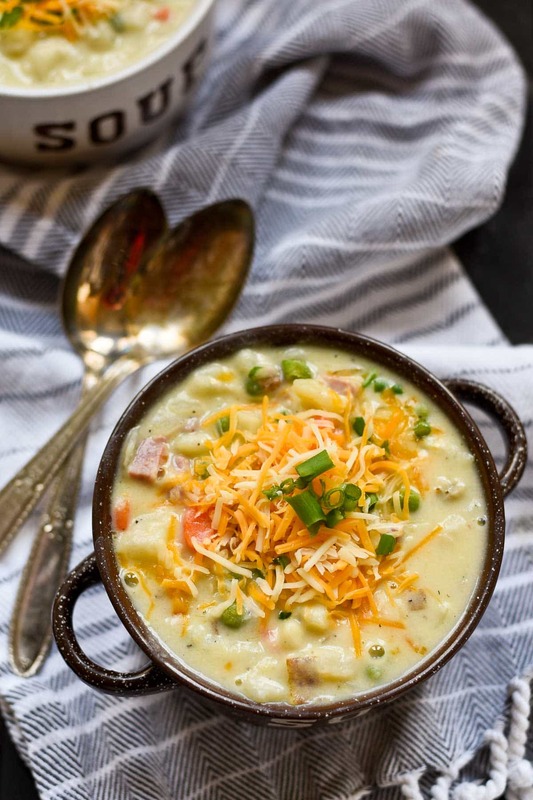 For those few crazy weeks, we lived almost entirely on holiday leftovers and this Creamy Ham and Potato Soup. I made a giant pot of it with some leftover ham from an early Christmas celebration, and I ate it nearly every day for lunch. There’s nothing particularly unique or unusual about this soup. It’s pretty much your standard potato soup, loaded with onions, carrots, garlic, and hunks of ham in a smooth, creamy broth. I love adding frozen peas to mine for a touch of sweetness and celery is always a nice addition if you have it. 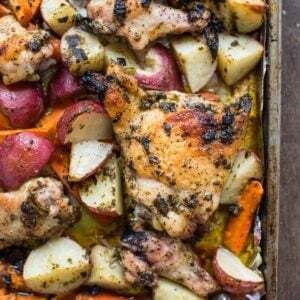 This is the kind of meal you’ll want to hunker down with on a cold winter night. When you see that Winter Storm Weather Advisory flash across your television screen, forget about going to the store for the milk and bread. 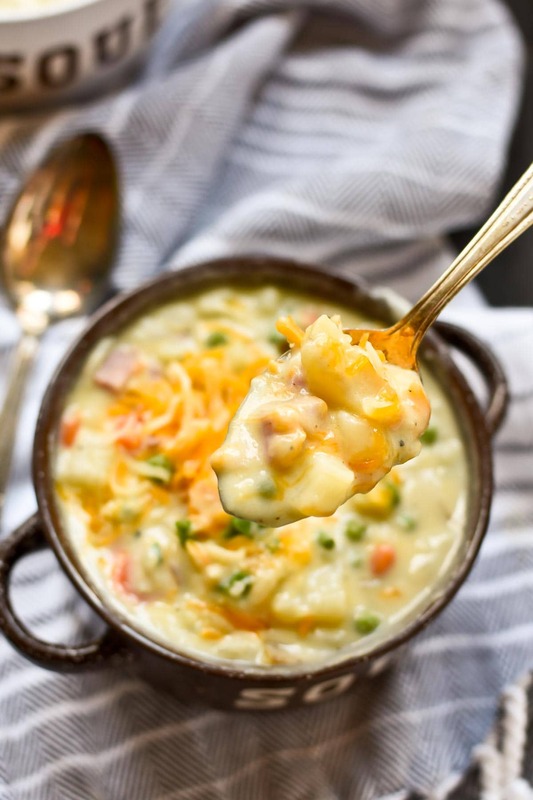 Instead, grab the ingredients for this satisfying, comforting Creamy Ham and Potato Soup. If you’re going to be trapped at home, you might as well have delicious soup, right? 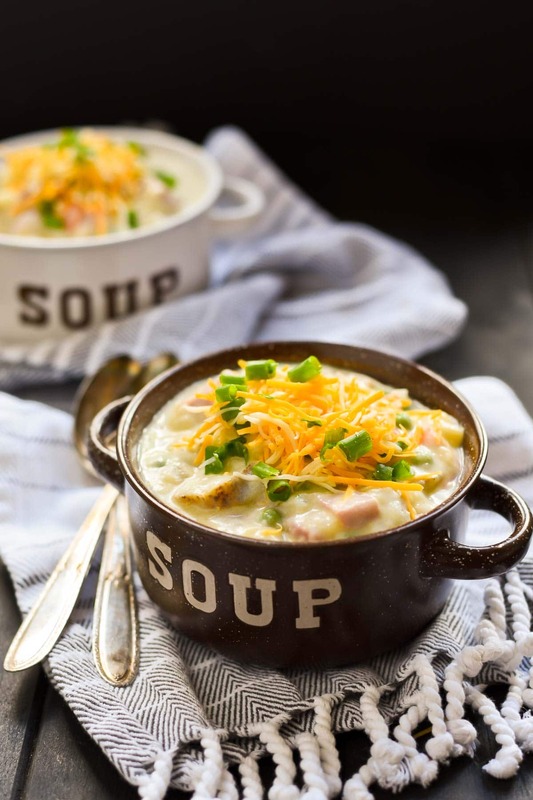 Here are two more fabulous soup recipes for your #SoupWeek eating pleasure! In the bottom of a large cast iron skillet, heat the olive oil over medium heat. Add the onion and carrots and saute for 2-3 minutes, stirring occasionally. Add the potatoes and the chicken broth. Increase the heat and bring the mixture to a boil. Cook over medium high heat for 8-12 minutes, or until the potatoes are tender. Stir in the ham. Meanwhile, in another medium sauce pan, melt the butter. Stir in the garlic and saute until fragrant. 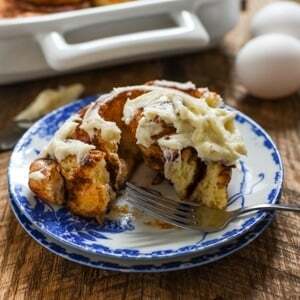 Whisk in the flour and cook until bubbly and thick. Slowly add the milk and half and half, whisking constantly. Heat for 3-4 minutes, whisking often, until mixture is thickened. Stir the milk mixture into the potato mixture. Stir in the frozen peas and heat until hot clear through. Season to taste with salt and pepper. Serve with cheese and chives, if desired. This is a God-send! I have lots of left-over ham to use up and this looks easy and deelish. Can’t wait to try it! Yay! I hope you really enjoy it! Looks delicious and beautiful photos, as usual! This soup recipe is absolutely delicious!!! I used a little over 2 cups of leftover Thanksgiving turkey and ham. I omitted the potatoes but did add leftover stuffing toward the end for a little more thickness and I used frozen corn kernels instead of peas. Love it!!! Thank you so much. Just made this, minus the peas as I didn’t have any. Turned out fabulous! The family is quietly enjoying right now. Reminds me a bit of the potato and ham soup served at Denny’s! Thanks for the recipe!